I was a bit tired on Friday night so I did not do much. 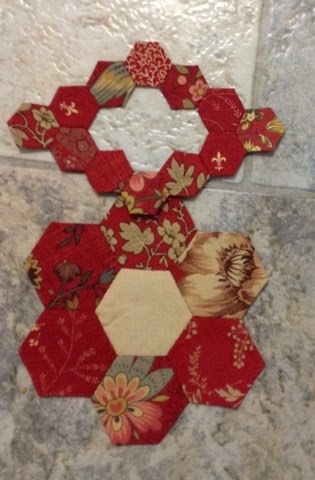 I went back to my Cornelian quilt and sewed together a couple of hexies. Hope you all had a fun night sewing and thanks Wendy for hosting. Lovely hexies Kim, is that French general you're using for them? It was lovely to catch up with you yesterday :) Barb. Pretty hexies - every little stitch helps. Pretty hexies. I haven't even stated this quilt have it all here ready to start. Oh love your hexies and fabrics. I enjoyed chatting and catching up with you on Saturday and thanks again for the lovely fabrics. Love the colors you are using in this quilt Kim. Lovely hexies, always soothing to sew them. Lovely work, sew pretty ! We all have those slow days sometimes... Very pretty hexies though. Love your hexies. Made in such beautiful fabrics.